It’s like Halloween in June here on the old Franklin Street. To say that yesterday went less than swimmingly would be an understatement. Indeed, it was an unpleasant day of very high magnitude, with the exception of three highlights. The first occurred during my lunch break (and no, it wasn’t lunch, you smart asses). It was much better than lunch. 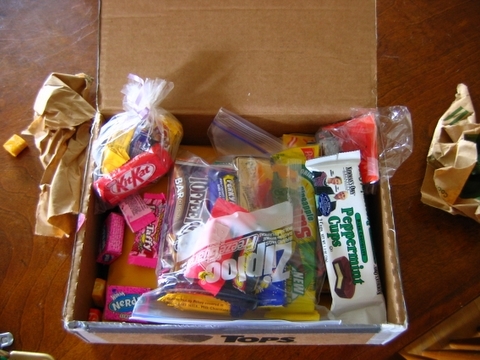 It was a brown parcel on my porch…filled with candy. You see, there’s a bbs that I have been posting on for a number of years now, and the people there have become like a second family. When people are injured, we chip in with money (or physical assistance if someone is close by). When someone gets married, everyone is invited. We have a photo gallery of silly images, we send business to each other, and when we are in each other’s home areas, we visit. We have a book club, even. We have shared triumphs and tragedies together, and I know many of these people better than I know my friends. We also try to get a community spirit going with a mail exchange every now and then. Sometimes we exchange art, knitting projects, good books…and right now, the exchange is candy, glorious candy, from all over the world. 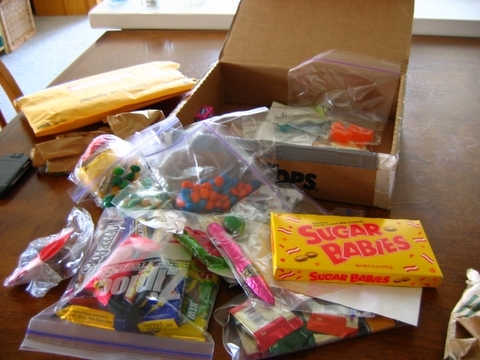 Each of us mailed in a packet with enough for seven people, and each of us got back a box choked to the gills with amazingness. I’m sure in the next few days that I will be posting images of the more unusual offerings (we have New Zealand and Canadian candy in here, somewhere). 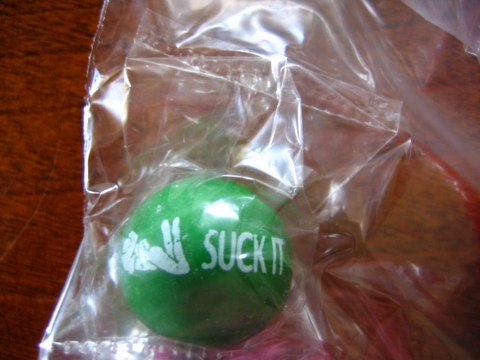 I’ll leave you with this image, which pretty much sums up my mental state right now–it’s a jawbreaker from Tampa, Florida.